Josh Hader is an American professional baseball pitcher for the Milwaukee Brewers of Major League Baseball (MLB). He is the son of Tom Hader and Patricia Hader. His sun sign is Taurus. He worships Christianity religion. He attended Old Mill High School. Hader started playing baseball in school. Hader made his MLB debut in 2017. Josh Hader is 6 feet 3 inches tall. 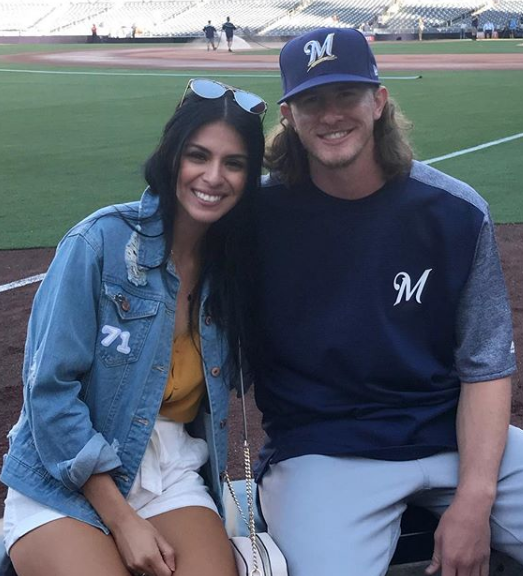 Hader is currently dating Maria Macias, whom he met in 2013. They became close after Hader sent a direct message to Maria on Twitter. Baltimore Orioles selected Hader for MLB draft when he was preparing to enroll at Anne Arundel Community College. Hader appeared in the SAL All-Star Game. In 2014, Hader was named the California League Pitcher of the Year. Hader played for United States National Baseball Team at the 2015 Pan America Games. In 2016, Hader played at the All-Star Futures Game. Hader was promoted to the major league in June 2017 and made his MLB debut on 9 June 2017. Hader became the first pitcher ever to record 8 strikeouts in an outing that was less than 3 innings long. Josh Hader was dragged into controversy and criticized for his series of tweets containing racist, homophobic and sexist content on his tweets from mid-2011 to late 2012. The tweets were discovered during the 2018 MLB All-Star game, and friends and family of Hader that were invited to the game had to wear a blank jersey. Hader officially issued an apology and deleted his account on Twitter as well. Hader went on fire during a National League Championship Series Game 1 against Los Angeles Dodgers at Miller Park. Hader pitched three clean innings with a season-high 46 pitches. However, Hader wasn't the first reliever. He replaced the first reliever, Brandon Woodruff.